FORT BRAGG, N.C. -- According to the Snell Memorial Foundation, a not-for-profit, helmet safety organization, per vehicle mile, the risk of death is about 20 times higher for motorcyclists than for passenger car occupants in a traffic accident. Because of this fact, U.S. Army Special Operations Command follows the Army's motorcycle rider training model and supports motorcycle rider training utilizing the Motorcycle Safety Foundation (MSF) training programs. The MSF conducted a study which revealed that since 1997, motorcycle fatalities have increased approximately 10% per year, and as of 2013 make up 13% of all traffic fatalities. 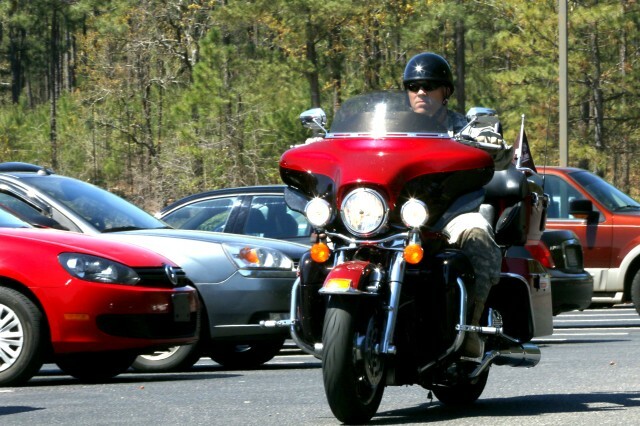 Tiffany Kettell, USASOC safety specialist, states that 2009 marked the worst year for USASOC regarding motorcycle accidents, with a total of seven fatalities and 30 accidents. Since then, these numbers have been on a steady decline with as little as zero fatalities in 2011, and only a single fatality so far this year. USASOC's decrease in annual motorcycle fatalities is largely due to the organization's diligence in implementing motorcycle training standards, and motorcycle riders within the command recognizing the value of this training and applying what they learned to daily riding practices. According to Army policies, in order to ride (a motorcycle) on-post, personnel must have attended the Basic Riders Course (BRC) taught either by the installation or by the unit level Rider-Coaches. Riders must also wear all of the personal protective gear required by Army regulations at all times while operating their motorcycles and practice safe riding practices on and off the installation. If a rider has an off-post (motorcycle) traffic violation, depending on the severity, it could affect their ability to operate a motorcycle on-post. Chief Warrant Officer 5 Robert Hash, Global Operations Warrant Officer for USASOC's G-33 section, has been riding motorcycles for approximately 30 years and believes that USASOC's motorcycle safety program is something every rider should complete every two years, not only because it's required, but because it can refine certain skills that many experienced riders may forget over time. "The Basic Rider Course is for people who are just starting out and are learning how to ride," he said. "The Advanced Rider Course is for those who are a little more experienced, like myself, I always go to the advanced course." According to Hash, once a Soldier completes the BRC (Required to ride a motorcycle on a military installation) the certification is valid across all installations, and Soldiers don't have to re-take it when they PCS (Permanent Change of Station). "It is an extremely comprehensive course, so if you've never ridden a motorcycle before in your life and you don't even know how to turn one on safely, this course will take you through it," said Chief Warrant Officer 5 Heriberto Serrano, USASOC Command Chief Warrant Officer and Rider-Coach. The difference between USASOC's program and those of other units throughout Fort Bragg, is that USASOC maintains personnel at the unit level that are qualified as Rider-Coach trainers who can conduct the required training for their unit's motorcycle riders based on their unique individual deployment cycles, this allows for motorcycle safety training to be tailored to the varying needs and schedules of each unit within the command. "This was done to alleviate the issues personnel were faced with when trying to participate in installation sponsored rider training, which was modeled to meet the Army's deployment cycle," said Powell Parks, USASOC Safety Director. "In order to maximize training opportunities, the U.S. Army John F. Kennedy Special Warfare Center and School conducts most of its motorcycle training on weekends because of student and cadre schedules that restrict time available during the week. 1st Special Forces Command (A) (P) provides advanced rider mentorship training for senior riders- who then serve as their unit's mentors." Motorcycle safety requires a commitment from the rider to invest time and effort in order to maintain or advance their skills as a rider. Due to the unpredictable deployment schedules many Soldiers within Special Operations typically experience, the command is committed to making the training available when the Soldiers need it. "Another thing that is unique to USASOC is the Commander's Rider Agreement (USASOC Form 4056). This document is a signed agreement between the motorcycle rider and the unit commander that helps the commander identify the motorcycle riders in the unit, assigns responsibility to the rider to abide by all regulations and requires the commander to be available for assistance and mentorship also ensuring that unit motorcycle riders are provided the opportunity to attend training in order to meet the standards," Parks noted.